I think we all realize that good sewing room lighting is very important. In this article, I tried to create a summary of what we really need to know about lighting in a sewing room. It is kind of tricky subject though, and I got a little bit too technical sometimes. If you would like to improve your current lighting situation here are some ideas to consider. I don’t have an unlimited budget, otherwise I suspect finding professional lighting equipment – and people to set it up – would not be an issue. 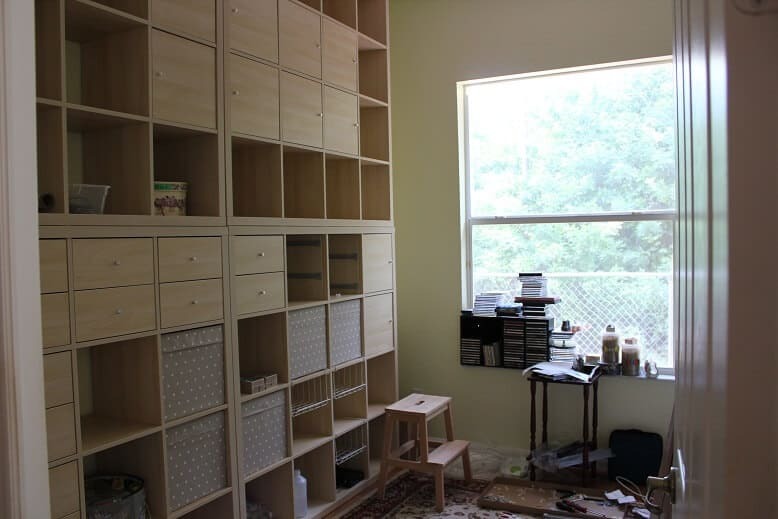 Therefore this article attempts to discuss ways of lighting your sewing room on a budget. 1. First would be that you need multiple sources of light. I have right above my sewing table a chandelier that has 5 long arms and because it’s exactly above the middle of the table, the table itself is illuminated properly. But my husband has an LED shop light in his workroom and he likes it. And I think LED shop lights will be a great solution for a sewing room especially if it’s in the basement of the house or in the garage. Look at this shop light: it has 5 stars ratings and there are more than 500 reviews! “Brightech’s innovative LightPRO LED Shop Light replaces inefficient fluorescent tubes and provides ultra-bright beams of cool white light over your industrial workstations, garages, repair shops, and equipment rooms. 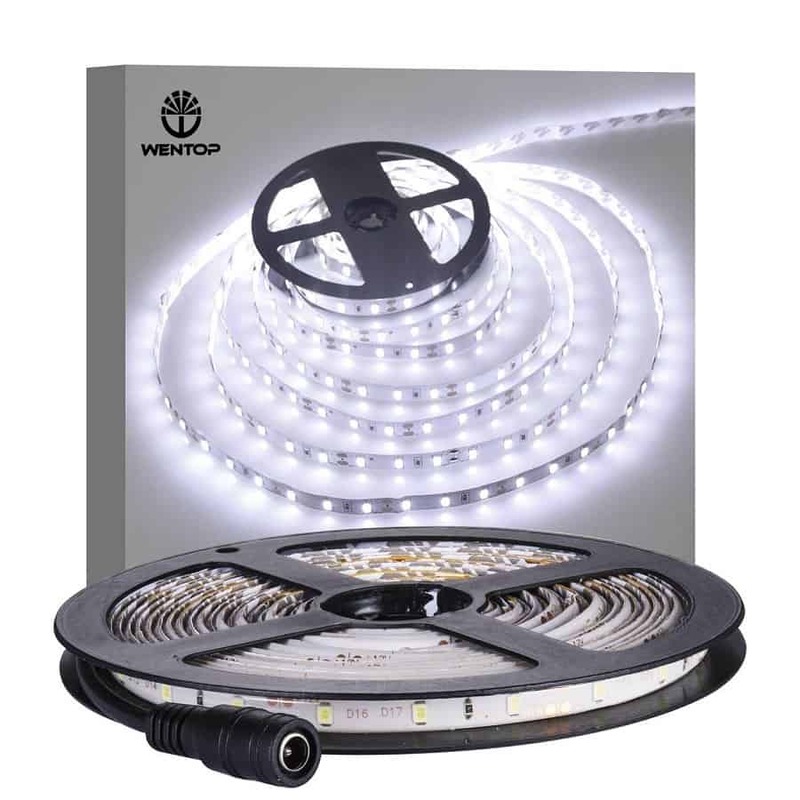 This lightweight, energy-saving overhead fixture features a pair of integrated LED lights that draw only 40 watts in total yet produce brightness comparable to 100-watt bulbs. 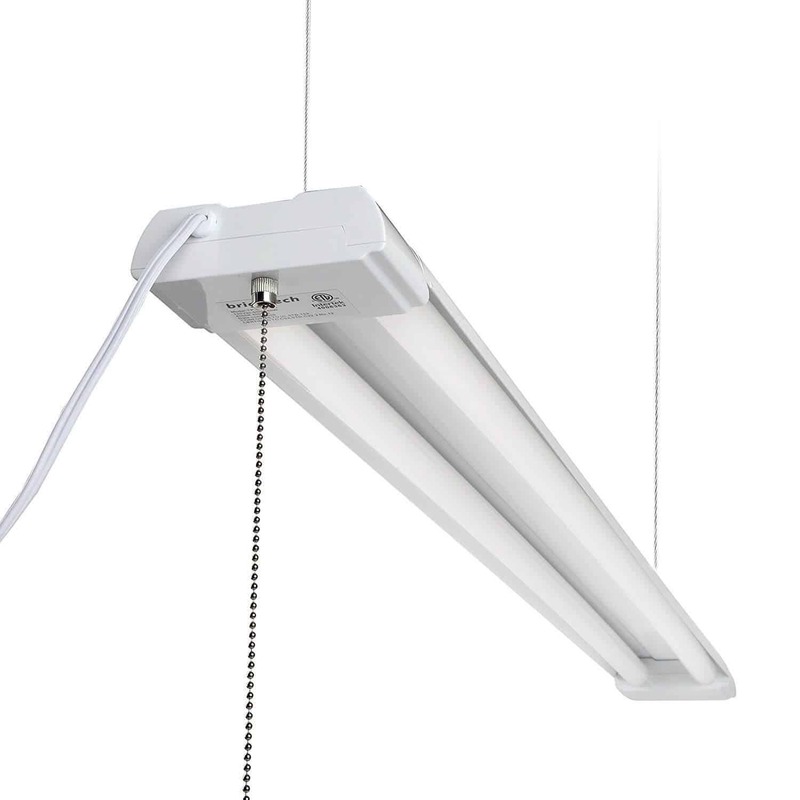 I personally like this fixture because it’s much brighter than standard fluorescent lights, it’s long-lasting, it saves energy and there are no long glass bulbs to replace (the LED tubes are encased in flexible plastic). So, I have resolved the problem of lighting the table, but this is not the whole story. What about the ironing board? Certainly, one does not need the same level of light when ironing, until you remember that handling a very hot iron is not something that should be done in the dark! And a sewing machine? Indeed, the machine has a light that illuminates the needle area, but this is not enough, one needs good light all around the machine; I would not want to start hunting for lost pins in low light either, chances are better than even that I will find it with my toe. What about storage/ closet? Have you ever looked for a thread in the closet only to end up taking all threads out because the color is impossible to see? I have! Therefore I believe it is necessary to have good light everywhere in the sewing room. Also, pay particular attention to areas where light from the windows or lamps doesn’t reach such as corners behind some furniture ( but I need to use every corner of my sewing room). Since it is almost impossible to cover all the corners of the room with one light source my preference is to have other smaller sources in key places: a desk lamp for the area around the sewing machine (or sewing machines, I personally have 6 of them) , a floor lamp that I can move to different areas if necessary (for example, over the ironing board area), a separate closet light. It has 4,5 stars on Amazon and more than 5000 reviews! 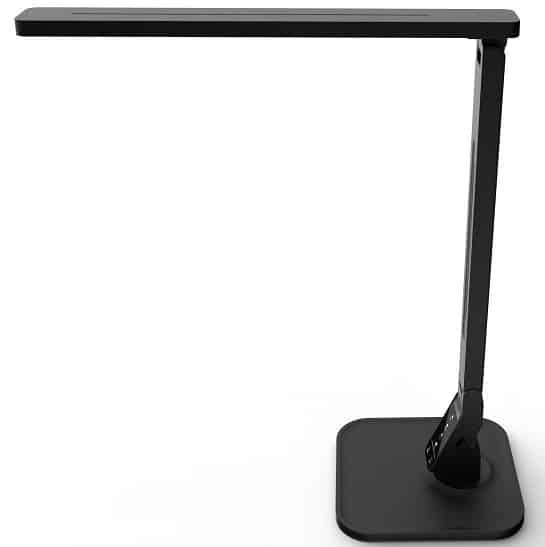 I like that this desk lamp has 4 unique color modes and adjustable brightness to allow you to customize your lighting, it saves energy and money with cost-effective LED lighting and you can choose from Black / White color to best match your furniture settings. The LED technology also reduces eye strain and glare for healthy vision and allows to see true colors, the light also has low heat. There are alternatives like this for example: Lampat LED Desk Lamp, Dimmable LED Table Lamp Black, 4 Lighting Modes, 5-Level Dimmer, Touch-Sensitive Control Panel, 1-Hour Auto Timer, 5V/2A USB Charging Port but I prefer the higher light intensity and the white color of the lamp and frankly the price difference is not that big. Those desk lamps are perfect to light the area around a sewing machine or a serger but I noticed that for every plus with this equipment there can be a minus: if I am sewing something big (like a quilt for example or a coat) or I use the biggest hoop of my embroidery machine the lamp may fell off easily. So I started to look at clamp lamps that can be fixed to the table: they don’t even stand on your desk instead they clip on the side of your table giving you 100% workspace! The head of the lamp swivels so you can change the angle of the light and the direction it is pointing without having to unclamp it and move it. In addition, the long neck of the lamp is also adjustable so it makes it easy to adjust the height of the light. Very useful tool indeed! Let’s look now at floor lamps that allows you to easily direct the light to exactly where you need it. I recommend something like this Natural Daylight LED Flex Floor Lamp. 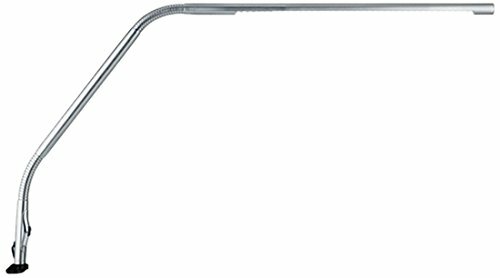 The Natural Daylight LED Flex Lamp has an expansive 12.5-inch shade and a rubberized flexible neck. With touch activated controls, you can adjust the brightness levels and the smart memory feature remembers your last brightness setting. It’s really like natural daylight indoors! And they say that super bright natural daylight OttLite leds rated to last up to 40,000 hours! This string light is very easy to set up because it has self-adhesive back for a safe and easy application. It’s safe to use because the working voltage is 12V only so it’s touchable. It can be cut every 3 LEDs along the cutting marks, without damaging the rest of the string. The length is 5 meters (almost 200 in). It lasts up to 50,000+ hours. The ribbon is flexible for curved areas. 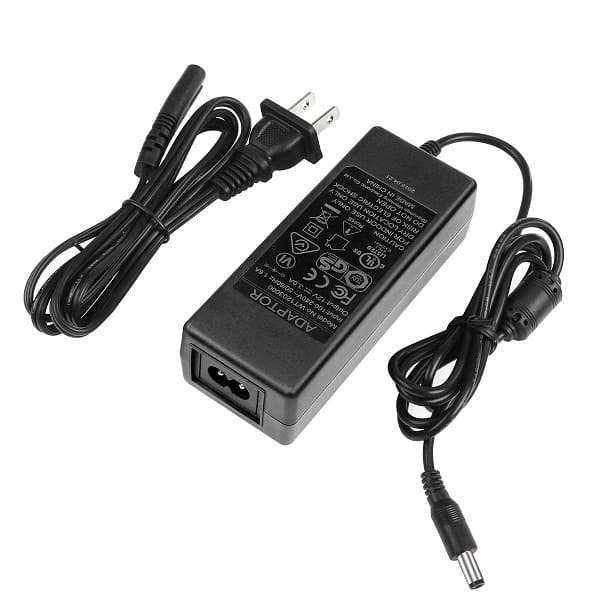 But beware this also needs an extra power supply like this LE Power Adapter, Transformers, Power Supply For LED Strip, Output 12V DC, 3A Max, 36 Watt Max, UL Listed. Yes, this requires a little bit of work to install but the result is well worth it, the closet looks different and I find things much easier. And the light strip looks so nice that I am planning to install it under the kitchen cabinets also. 2. The second tip to help you to make your sewing room lighting better is very simple – just change the light bulbs you can just screw into your existing fittings. What light bulbs available right now? There are 3 different kinds: incandescent, fluorescent and LED lights. Incandescent bulbs are not good anymore because they generate a lot of heat. When you have 500W or more in lights only in one room, plus a hot iron and one or two sewing machines, perhaps a computer, it will get HOT in that sewing room. Second, my opinion is that we should avoid fluorescent lights, even the newer compact versions, ( CFL, the spiral-shaped bulbs ) because of the possible stroboscopic effect. Have you ever looked at a moving needle in the fluorescent light? Sometimes it seems to not move at all, or move much slower than in reality. This is a so-called stroboscopic effect. Since the sewing machine has a separate light for the needle area this is not a big issue though, but I personally avoid them. I did use CFL lights for a while but I decided to discontinue them a couple of years ago. I have LED bulbs in every light in my house. LED bulbs are fast becoming cheap, they are reliable, do not get hot and are by far the best choice when energy consumption is taken into consideration. They provide an efficient and bright light. Besides they come in many shades, from warm white to daylight and anything in between. Plus they are supposed to last practically forever! 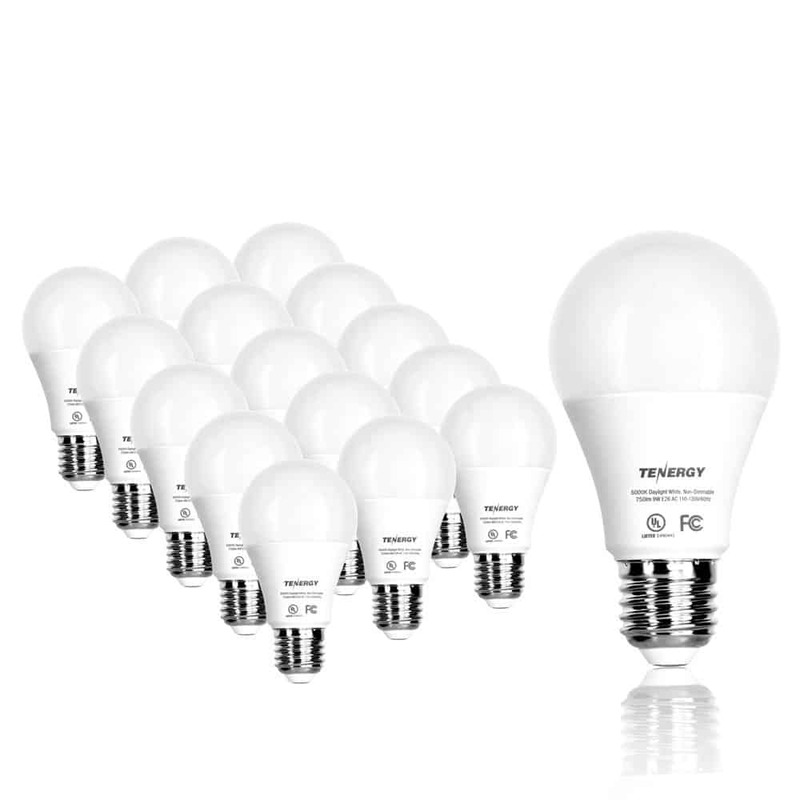 The Tenergy 16-Pack Non-Dimmable LED Bulbs are the perfect replacement for incandescent light bulbs. These E26 LED bulbs have medium standard bases. There are no breakable parts and they are free of toxic chemicals and safe for your family and the environment. I really like that the 750 Lumens LED bulbs are able to maximize its brightness immediately when powered on. It illuminates an equivalent of a 60-Watt incandescent bulb but only consumes 9W of power, making it one of the best energy efficient light bulbs! Non-flickering light and zero harsh glares prevent eye fatigue and provide a comfortable, stress-free atmosphere. Built with premium materials and circuitry, Tenergy LED light bulbs are certified by the rigorous safety standards of Underwriters Laboratories. They have a long service life with a special 3-year warranty. 3. I would also suggest that the sewing room needs to be painted in light colors and the furniture itself should be a lighter color. It may be a personal preference, but I do not believe so. Shades of white will make space feel brighter as it reflects the natural light entering the room. Dark colors absorb light. On rare occasions, I need a longer table which does not fit in my sewing room and in these instances I am using a portable table that I set up in my living room. There are dark brown bookcases there, desk, etc. No light colors. Guess what? The room has 10 feet ceilings, two large windows ( 72” wide ) facing South PLUS a 9 feet high patio door, also 72” wide. And I need to turn on the lights! I see that they recommend painting the ceiling a couple of shades lighter than the walls to create the illusion of height and space. Also, choosing a paint with a satin finish will help reflect the light more than matte paint. You can also use metallic, glass and mirrored accessories with a reflective surface to make the room brighter. I change closet sliding doors in my sewing room to mirror ones and it really makes a difference. 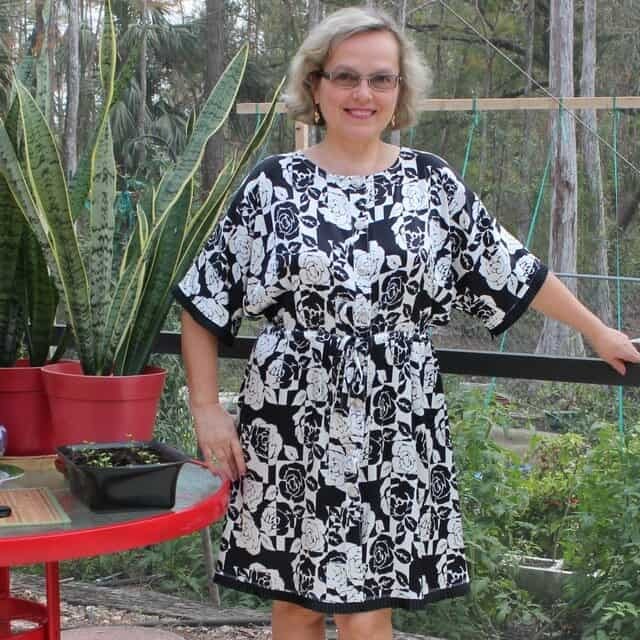 Below you can see my sewing room with those mirror sliding doors from Home Depot. 4. Try to use natural light as much as possible. Big windows, south windows. 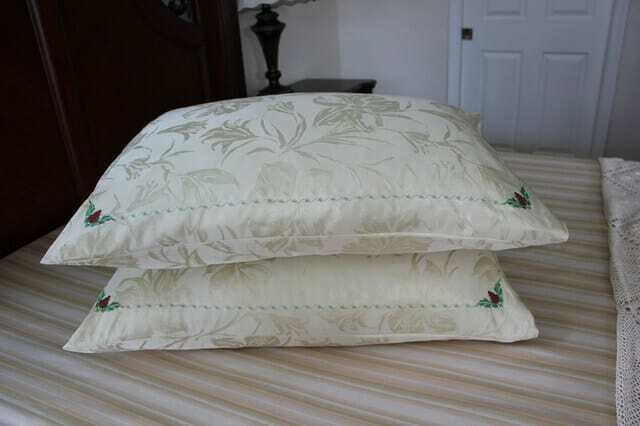 There are real benefits associated with sewing in rooms that offer abundant natural light. Research has proven that natural lighting helps people be more productive. Lighting psychology says that bright light creates a more positive and energizing environment. It’s proven that natural lighting reduces eye strain and makes it easier for people to see. Natural light is free, and the more you have, the better you see. 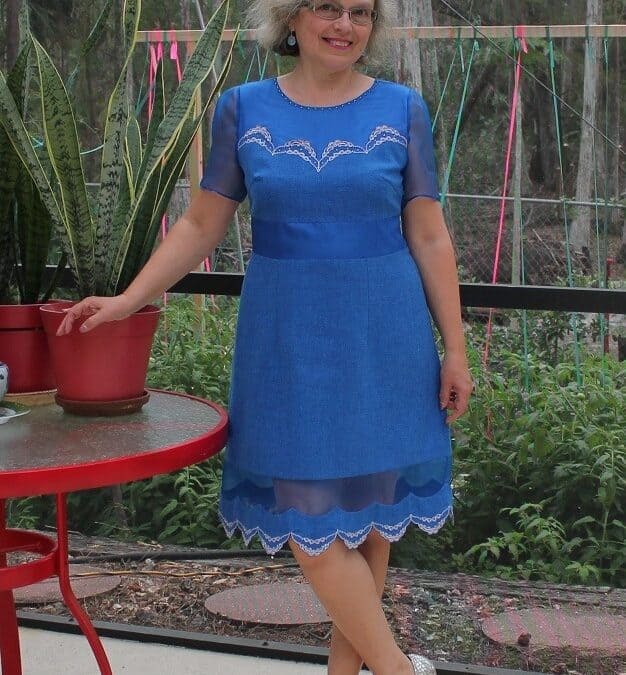 My sewing room has two big windows so I have good natural light and I really like it. But now I decided to make another sewing/office room from a bedroom and that room has only one window and it’s tinted so it’s quite dark even with light color furniture. I will have to take the tint out to get more natural light. Natural light is good but we often don’t have this possibility, many people sew in their basements. Many people sew at night after the day job. So buy the best quality artificial light that is really similar to natural daylight. 5. Use lamps with magnifiers. A magnifying lamp is perfect for any kind of close, detailed work and is an essential tool not only for people who have trouble with their vision. 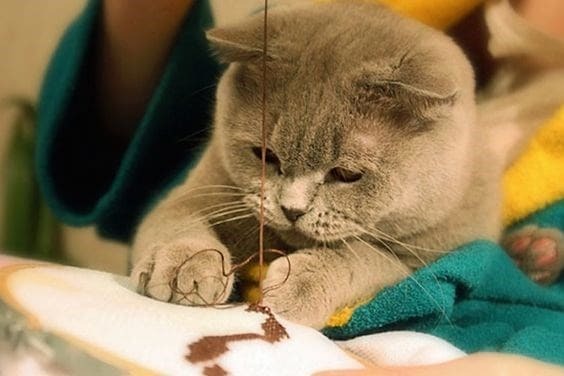 Even if you have perfect sight you may need one to see the small details like the needle’s eyes, the thread’s ends, stitches, etc. Lighted magnifiers can also reduce eye strain and fatigue. A magnifying lens would be useless in the dark, so combining magnification with proper lighting will result in better vision. 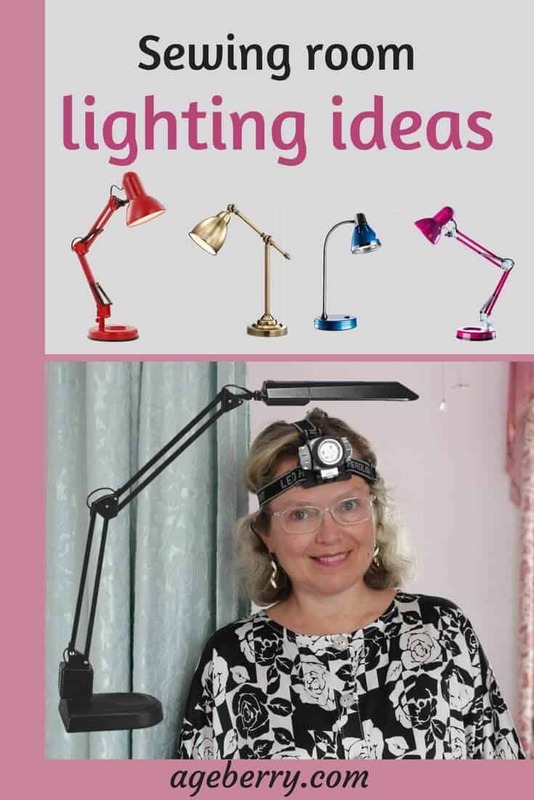 A magnifying lamp is made for hands-free viewing which is really essential for sewing because it is much easier to have both hands free to grasp a needle and a thread for example and not worry about holding a magnifier or light. 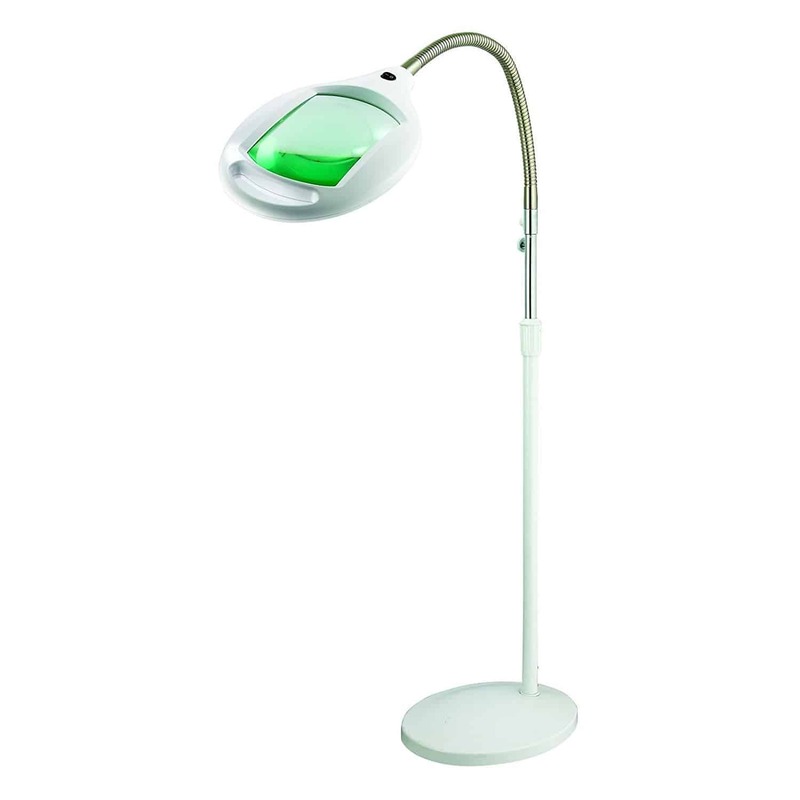 Magnifying lamps have flexible arms which are good for adjusting the location and the angle of the light and magnifier to best suit your project. Also, with the LED lights, the lamp stays cool. A heavy base keeps it sturdy so it doesn’t tip while moving and adjusting the lamp. I have an older version of a magnifying lamp and it helps tremendously when I am working with smaller items like buttons, beads, etc. But I need to change it for the LED one. I did some research and came to a conclusion that the market is so crowded with choices and it’s really hard to decide on the right lamp. 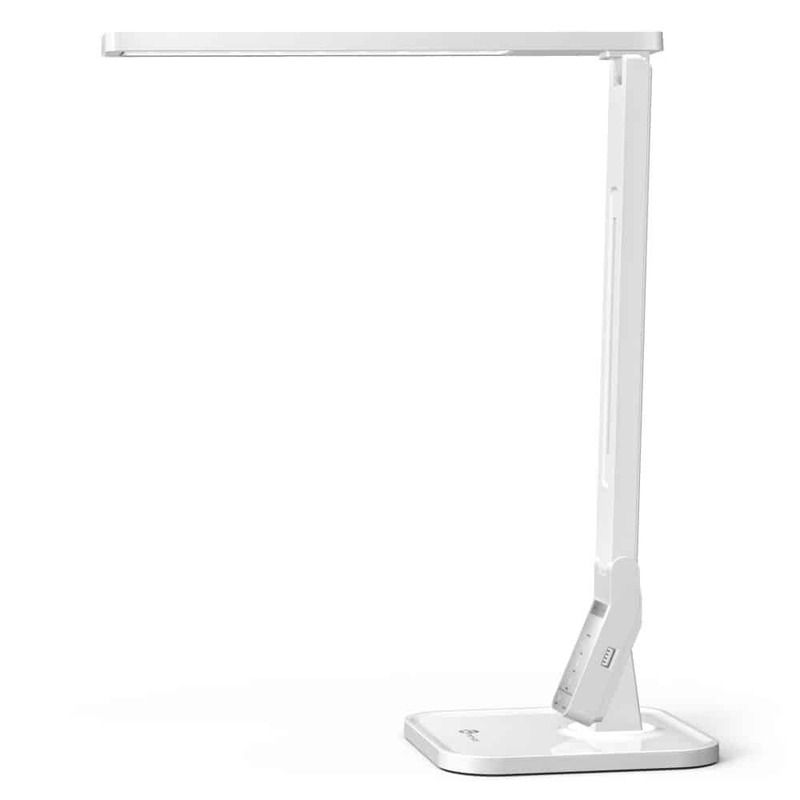 I like the best this one: Brightech LightView Pro LED Magnifying Floor Lamp – Daylight Bright Full Spectrum Magnifier Lighted Glass Lens – Height-Adjustable Gooseneck Standing Light. It has more than 2000 reviews and the rating is more than 4 stars. Sometimes I borrow a headlamp from my husband when I need some extra targeted illumination around my serger. 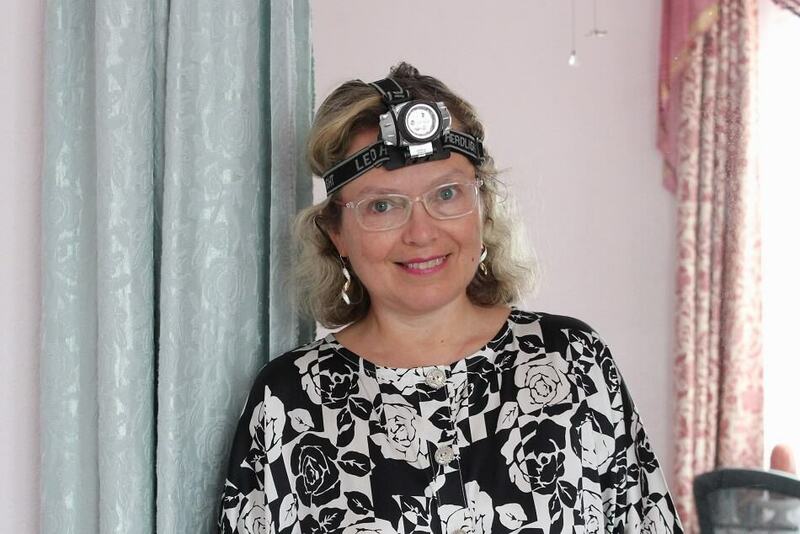 You see, it’s much easier to rethread the serger (which is not an easy job) with this headlamp. I don’t have good eyesight and it really helps to have this bright light directly on my serger when I rethread it. 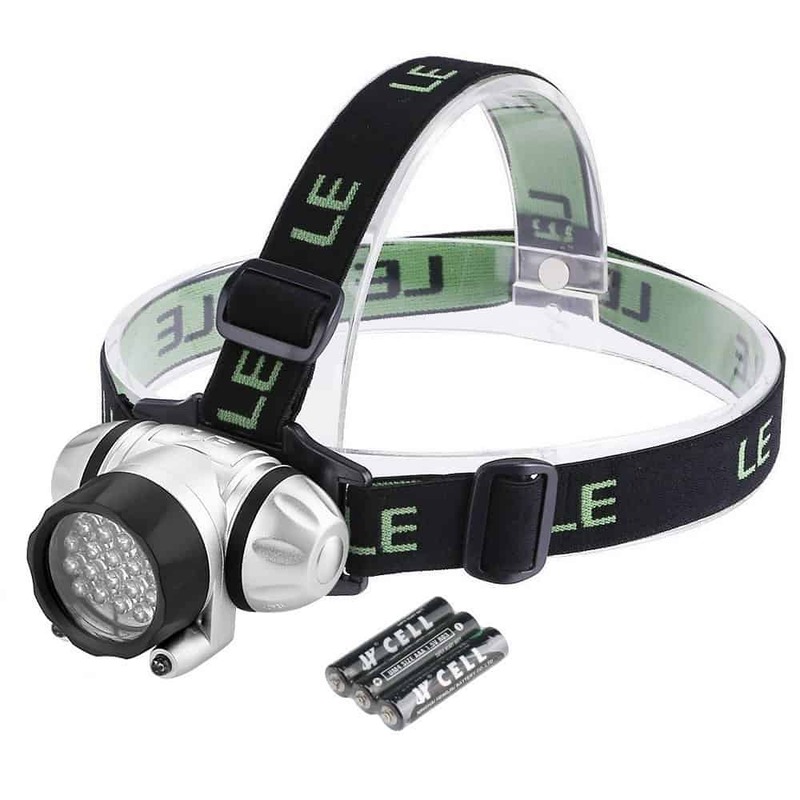 The headlamp is compact and lightweight and has a wide-strap adjustable elastic headband and it fits my head without any problem. It can be rotated down to more than a 90-degree angle. It works on batteries. So these are 6 simple steps you can follow to choose proper lighting for your sewing room. Did you find this article helpful? If so, I will be incredibly grateful if you consider sharing it with a friend who might find it useful too. In addition to helping them, it also helps my site grow! Also, please leave a comment below as I’d really love to hear what amazing ideas you have! 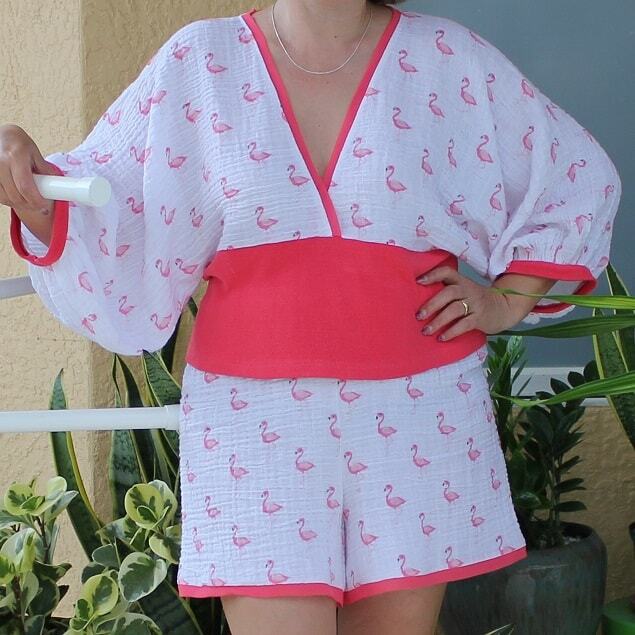 Ready to take the next step in your sewing journey? Love the headlamp! I am currently working with black fabric and was just telling my sister that a head lamp would be perfect when working with dark fabrics! AND I LOVE led lighting! Thank you for stopping by! My friends were making fun of me when they saw what I use. But it really helps! So why not to use it when necessary, right? And your idea about using it with black fabric is great. The Interior lightening room looks like an awesome and fantastic. Such kinds of information you share that inspires me more to decorate my sewing room beautifully. Thank you for your kind words! I didn’t learn Spanish yet, I used Google to translate your comment.